The Hubspot people just launched a new (and free) marketing tool today called Marketing Grader. Hubspot is a strong promoter of Inbound Marketing and has launched other tools in the past including Website Grader, Twitter Grader and Blog Grader. Marketing Grader is actually the ‘shiny new thing’ that is replacing the Website Grader (but you can still access Website Grader if you want to). While Hubspot’s primary focus is to sell a comprehensive Inbound Marketing platform, they do an excellent job with providing free resources and tools to promote the concept of Inbound Marketing. And the new Marketing Grader tool is a homerun in my book – so much so that I knew I had to write a blog post to showcase what it can do. To start the grading process, you enter the URL of the website you want to measure. You can also add up to two competing websites for comparison purposes. For my testing purposes, I used a company and industry that I was familiar with as I used to work there for more than three years. The summary calculates an overall score on a 100 point scale and then analyzes how the website is doing for Top of the Funnel (ToFu), Middle of the Funnel (MoFu) and Analytics. Not only does the tool provide a percentage score of how well the website is doing, it also identifies the top recommendations to improve the score. It is interesting to note that a URL for the iRise blog was found, but the blog has not been active for more than a year and the link currently redirects a user to the homepage. So, iRise is getting credit for a blog even though it is currently not accessible or active. Competitive Benchmarking: Is my marketing more or less effective than my competition? 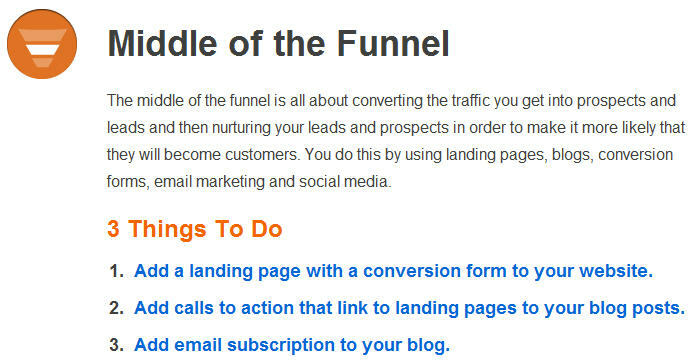 Lead Generation: Are my marketing efforts generating enough leads and sales? Mobile Marketing: Is my web presence optimized for mobile devices? Social Media: How effectively are we using Facebook, LinkedIn, and Twitter in our marketing? Blogging: Is my blog driving results that justify the time investment, or are we wasting time doing the wrong things? Overall Analysis: What are the strong points and shortcomings in our marketing? Overall, this is a great tool and resource for improving your marketing function. The tool has an appealing interface and there is a lot of information included in the report along with explanatory links. My recommendation is to Run, Don’t Walk and turn the new Marketing Grader loose on your own website. Did I mention that the new Marketing Grader is FREE? 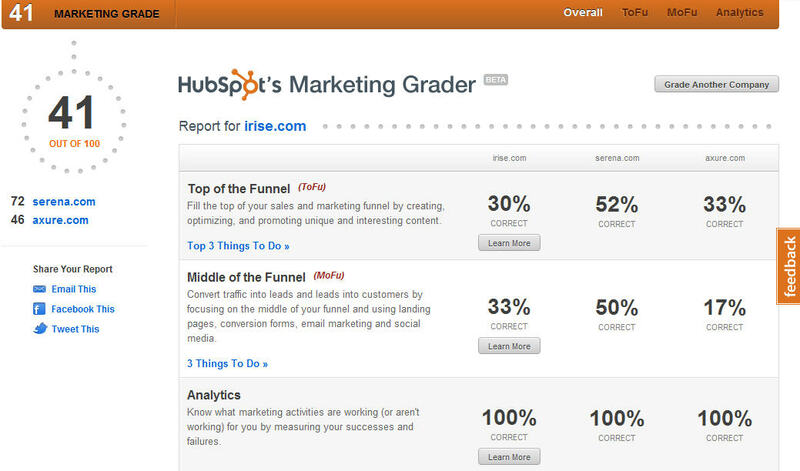 For more background information on Marketing Grader, check out these blog posts from Hubspot product manager Karen Rubin in the OnStartups.com website – Insider Tips from Hubspot’s Launch of Marketing Grader or from the Hubspot blog – Hubspot Launches Free Marketing Grader Tool to Replace Website Grader.